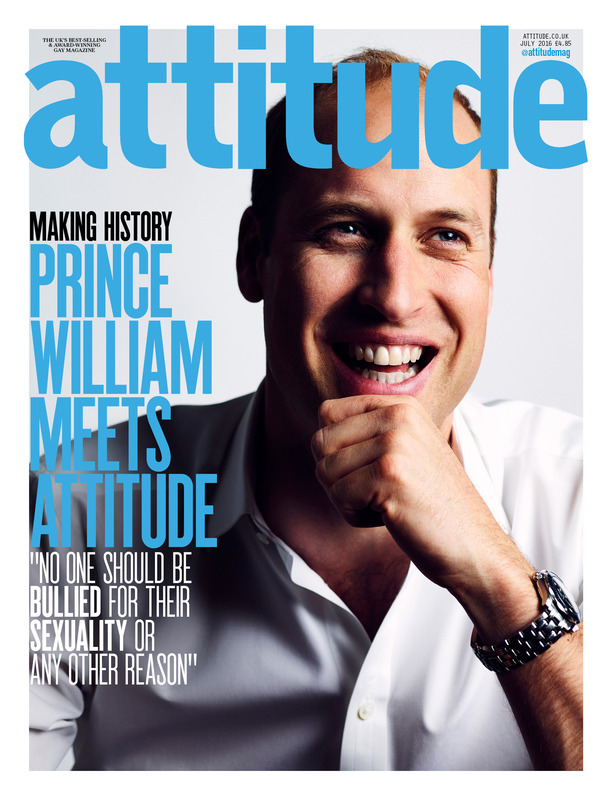 The Duke of Cambridge is on the cover of the next issue of Attitude Magazine, speaking out against bullying. On Thursday 12th May 2016 The Duke of Cambridge invited Attitude magazine to bring members of the LGBT+ community to Kensington Palace to listen to their experience of bullying and the mental health impacts it can have. The discussion was facilitated by Attitude editor Matthew Todd. LGBT+ Individuals explained how bullying had led to low self-esteem, suicide attempts, eating disorders, depression and drug addiction including, in one case, the death of a young man after an unintentional overdose. HRH then posed for the cover of Attitude photographed by Leigh Keily. The PACE RARE report (2015) found that 33.9% of young LGB people had made at least one suicide attempt compared to 17.9% of young straight people. 48.1% of trans young people had attempted suicide. 57.1 % of LGB people had self-harmed at least once compared to 38.3% of heterosexual young people. 85.2% of trans young people had self-harmed as opposed to 47.4% of cisgender (born into the body you feel you are) young people. Speaking to Attitude, The Duke commented: “No one should be bullied for their sexuality or any other reason and no one should have to put up with the kind of hate that these young people have endured in their lives. The young gay, lesbian and transgender individuals I met through Attitude are truly brave to speak out and to give hope to people who are going through terrible bullying right now. A Kensington Palace spokesman said: "The Duke of Cambridge is working hard to support the fight against bullying and to help break the stigma around mental health. He has established a taskforce on the prevention of cyberbullying and along with The Duchess of Cambridge and Prince Harry is leading the Heads Together campaign on mental health and well-being. "He knows that LGBT young people suffer unacceptably high rates of bullying and he was grateful to Attitude for facilitating such a serious conversation on this topic. He was moved by the stories he heard and impressed by the positivity and courage of the people he met." This issue of Attitude magazine went to press on Wednesday 8th June, just days before the devastating shooting in Orlando which saw 49 LGBT+ people lose their lives. Attitude sends our most heartfelt condolences to those affected by this atrocity. Around the world LGBT+ people experience hatred and violence every day. Such violence does not exist in a vacuum but snowballs from intolerance and bullying that begins in classrooms, too often comes from politicians, religious leaders and is often not treated with respect by the media.